The following are links about Pleasant Street you may find interesting. Also check out the other pages. The following are comments left about Pleasant Street from site visitors such as yourself. They are not spell checked or reviewed for accuracy. I lived on Pleasant Street from 1933 to 1938, and went to Winslow Street School. Miss Butterfield and Miss Smith were kindergarten teachers. Mr Toomey taught 5th grade. The store in the photo on the corner of Main and Pleasant streets was Easton's and they made the best vanilla frappes! where the cigars store is in this picture is now a glass building that is 25 floors tall. My mother worked at Easton's in the 50s. 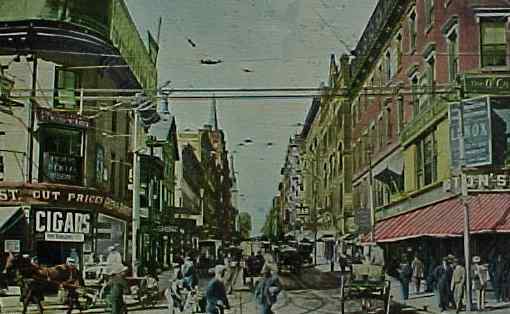 The building in photo on the right corner of Main and Pleasant St was the F. A. Easton Company, a newsdealership. My Great GrnadUncle and Civil War vet and Hero, Col. Fergus A. Easton opened this locaton April 17, 1893 and although Uncle Fergus died in 1916, his business continued until 1965, the year of his wife's death. Does anyone know if the building remains today? In it's heyday, it was a frontrunner for the local soda fountain counter service, etc. Great site! Glad to find this photo of my Great GrandUncle Fergus Anzle Easton's store at the corner of Pleasant and Main Streets. Over the red awning yu can make out a portion of the name, Easton's. He was an immigrant of Scotland who served in the Civil War and upon his death in Dec. 16, 1916, the headlnes in the Worcester Paper read: Col. Fergus A. Easton dies of pneumonia. Although he died in 1916, the business remained open until his wife's death in 1965! The F. A Easton Company store at the corner of Main and Pleasant Streets and the branch store at 266 Main St. The Pleasant @ Main store was established April 17, 1893 and operated as Easton's until 1965. Col. Fergus Anzle Eston was a veteran of the Civil War, fought in many battles including Gettysburg, where he was a Lt. in the 6th NY Cavalry. Col. Easton was my grandfather's paternal uncle. Col. Easton's death in 1916 made big front page headlines in all the Worcester papers. A man ahead of his time! There is now a Dunkin' Donuts in the Easton's space. My grandparents had a antique shop on pleasant st call Listenik;s Antiques. I can remember going to all the small museums in the area as a child and going to Woolworths for banana splits. I lived on Dayton Place and used to travel the neighborhoods to see friends and I remember Pleasant Street always being and area filled with hussle and bussle. 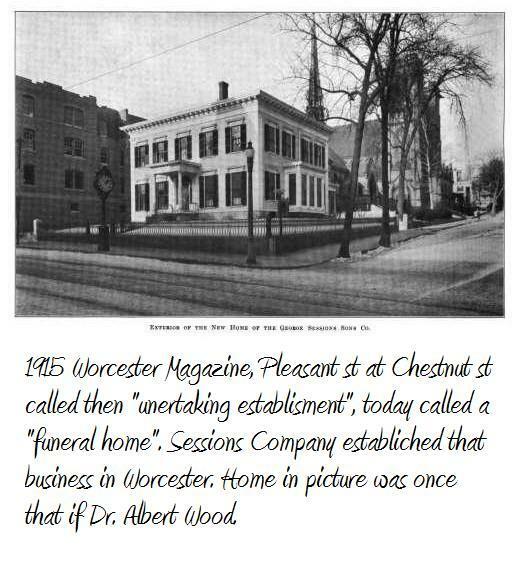 My Uncle Douglas Easton (of Boston) remembers visiting Worcester with his father, John Geddes Easton about 1943 for an American Legion Convention. While there, they visited "Uncle Fergus" place, "Easton's". Although, Uncle Fergie, Col. Fergus Anzle Easton died in 1916, "Easton's" was still in business until about 1965, when his third wife died. "Col. Easton" was a renowned cavalry man of the Civil War, serving with the 6th NY Calvary, orginally enlisting at So. Hingham, Mass. His final resting place is in Cohasset, Massachusetts. After seeing this photo last year, I made a visit to Worcester and was quite happy to see Fergus' store, "Easton's" site was still there, not another victim of urban renewal! Presently, a Dunkin' Donuts occupies the site and use a similiar awing (red and white stripe) as Easton's had at the turn of the last century. One of the few establishments to survive the changes downtown is Tammany Hall on Pleasant St. I always remember the policeman who directed traffic at the bottom of Pleasant St -- he would always ask me which way I was going and I'd point left, toward Lincoln Sq. He would laugh and wave me along. Years later, I found out he always laughed because it was illegal to turn left from the bottom of Pleasant St.
INTERSTING INFO ON COL. EASTON. I AM WITH THE 6TH NY CAVALRY LIVING HISTORY GROUP BASED OUT OF MIDDLEVILLE, NY AND TO HERE REAL STORIES ABOUT OUR TROOPERS FROM THE SIXTH IS GREAT. IF YOU HAVE ANYMORE INFO I WOULD LIKE TO HEAR ABOUT IT. My recollection of Pleasant St. is not nearly as old as others on this post, however, my father had one of the six cars crushed in the Pleasant Street garage collapse in the 1960s. He was leaving his law office on Main Street, but was delayed by a phone call which probably saved his life. He believes he would have been in his car precisely when the roof came down. In response to Jerry Borden - I actually found Uncle Fergus' family - at the time his granddaughter was alive at age 93 in Fl, her son, grandson and great grandson were all in the greater Boston area. They're now in Calif. and SC. Did get a chance to meet with them and saw Col. Fergus' copy of the Regimental History of the 6th NY Cavalry. Sue Martin is another person to contact regarding the 6th NY Cavalry, now living in Gettysburg, PA. Note: if you google Fergus Easton's name, you'll find her site!! Please contact me regarding Col. Easton. Thank you for the interest. Regarding Barbara Baird Smith - would love to know if your mother had any photos of Easton's and perhaps the then widowed owner, Jean Cameron Easton and her memories of working at Easton's in the 50's. Thank you. Remember Easton's as a place to rest, sit on a stool and have a tonic (soda). Up the street at 43 Pleasant street was the evil Homestead Cafe later it became "Tammany Hall". Was the Homestead Cafe a hang out referred to as Lano's? It was a few doors up from the Fine Arts Theater.I also remember racing miniature electric cars as a kid on Thursday nights. Perhaps the same location? Easton's , on the corner of Main & Pleasant St was a favorite place of ours in the 50's & early 60's. There was a wooden floor and a counter to eat. One of their best sandwiches was Cream cheese & Olives, or you could have cream cheese and Jelly. Nothing like it. Was sad when this closed and eventually was turned into a Dunkin Donuts. Not sure what is there now. Easton was my great-great-grandfather`s adjutant. He was with g-g-grandfather the night he received orders to go on reconnaissance south to Spottsylvania Courthouse where he was killed in a skirmish with the forces of Fitzhugh Lee. I am so glad Col. Easton lived to tell the tale and did so well after the war ended. Growing up this was perhaps my favorite street. All Saints Episcopal is still there. My eye doctor had an office in a brownstone. Sprague and Fitton had a optician shop. And there was an office supply store. And Cottage Donuts was near the Pleasant/Main intersection. I had a big burly friend who had an unusual talent. He would stand on the sidewalk on Pleasant street and stare at people eating in Easton's. He would pick out women eating things he liked,especially pies. Without fail, they would get up and leave before they finished and we would go in and finish their meal. Col. Easton's granddaughter, Anzle Mead, passed away on Nov. 9, 2011, at the age of 99. The family held an open house and Col. Easton's photograph was among the photos displayed. Anzle was an extremely intelligent lady and sharp as a tack 'til the day she died. I can remember in the mid 60s working with my dad at worcester envelope and my dad buying the telegram every morning from a man named Homer. he sold papers at plesant & main everyday. 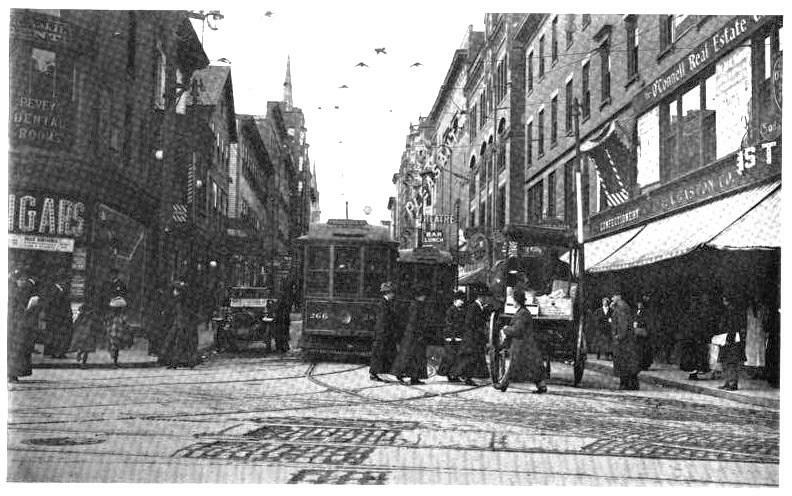 I had a great grandfather who worked at Verners Grocery at 371 Pleasant St. 1910. Has anyone heard of this place. My grandmother, Gertrude Wallin, would meet with her Worcester Normal School classmates on weekends at Eastons in 1923-24.